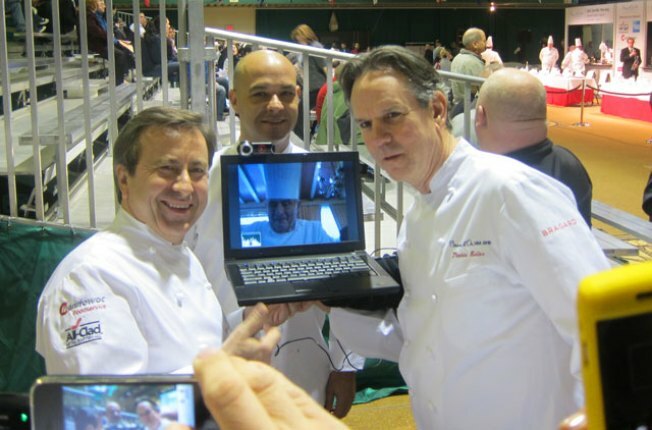 Left to right: Daniel Boulud, Jerome Bocuse, Paul Bocuse (via Skype) and Thomas Keller. At a competition at the Culinary Institute of America in Hyde Park, New York, this weekend, Eleven Madison Park's James Kent was picked to cook for the United States at the prestigious Bocuse d'Or international culinary competition, taking place in Lyon, France next February. Bocuse d'Or—the Olympics to the X-Games' Top Chef—was established by chef Paul Bocuse in 1987 and has emerged as one of the world's great chef competitions, though the US has been late to acknowledge its importance. Chef teams of one chef and one commis (assistant) from 24 countries around the world compete for the title. Last year, however, Chefs Daniel Boulud, Thomas Keller and Jerome Bocuse created the Bocuse d'Or USA Foundation for the express purpose of bringing a title home to the United States. In the past year, it has emerged as one of Boulud's highest profile pet projects. Though their 2009 bid in Lyon was unsuccessful, with a year to prepare perhaps Kent will fare better. “Thomas, Jerome and I and the entire Culinary Council are so happy to have selected Chef Kent to represent the United States at the international competition," Chef Boulud said at the awards dinner Saturday night. Kent and his sous chef, Tom Allen, presented their winning multi-course menu to an esteemed judging panel of Chefs Boulud, Keller and Bocuse, as well as chefs Grant Achatz, Paul Bartolotta, Timothy Hollingsworth, Traci Des Jardins, Paul Liebrandt, Walter Manzke, Daniel Patterson, Georges Perrier, Alain Sailhac, André Soltner, Susan Spicer, Laurent Tourondel, Alan Wong and Eric Ziebold.